A little over a week ago the kids had off school on Rosh Hashannah and June and I went to the library for Spanish Circle Time. We hadn’t been in several weeks and I found myself hoping the leader would play “El barquito chiquitito.” It’s one of my favorites in her rotation. The lyrics go something like this, without the repetition: Once upon a time there was a little boat that didn’t know how, that couldn’t sail. One, two, three, four, five, six weeks passed and that little boat sailed. When they sing it the kids pair off and sit on the floor facing each other with the soles of their shoes touching. They hold hands and lean forward and back, mimicking the motion of rowing a boat. Whenever Maggie was at the library she and June used to row the boat together. It’s adorable to watch, really, but that isn’t why I like the song. I find the simplicity of this little tale of mastery moving. Occasionally I would even tear up, watching June and one of her best friends pretending to row and I’d think about how much of childhood consists of this: you don’t know how to do it, time passes and then you do. The Spanish immersion program is like that. Noah walked into his kindergarten classroom knowing about ten words of Spanish he’d learned from Sesame Street and a couple months later he was chattering away in Spanish, not like a native speaker, but comfortably and fluidly. Because June is more of a perfectionist I thought she might appreciate a little more preparation so I taught her the numbers up to twenty and most of her colors over the summer, but that and a few phrases like “Buenos dias” was all she knew when school started. It’s been six weeks and she knows a lot more than that now. She doesn’t speak in Spanish yet, but she sings the songs they are learning every day at home. And believe me, she really can put a lot of dramatic flair into “La araña pequeñita” (“The Itsy Bitsty Spider”). She’s learned to roll her Rs and she’s always announcing, apropos of nothing, “I know the Spanish word for watermelon,” or something like that. “What is it?” is the proper response. “La sandía,” she will tell you, triumphantly. This was a big week at school for two reasons. June was star of the day on Monday and Tuesday and Señora T started assigning homework. Star of the day is a rotating position that involves being interviewed by classmates on the first day and being drawn by everyone in the class on the second day. The pictures are collated together into a book that goes on the class bookshelf. On Monday, as she does every Monday, June wore an outfit I’d chosen for her to school. (We call it “Mommy day.”) This week it was olive green cargo pants and an orange sweatshirt, both hand-me-downs from Noah. “I am so glad no one is going to draw me in these clothes,” she exclaimed and told us that tomorrow she would wear something that was “not boring.” Not boring turned out to be pink tights, a pink, blue and yellow plaid skirt, a white turtleneck and over it a tie-dyed red, pink and white t-shirt with a heart made of jewel-like beads at the center. She complained a little that evening that some of her classmates had paid insufficient attention to the design of the skirt, “One of them just drew Xs!” but overall, she seemed satisfied with the experience. Right before she started getting homework assignments, a big pile of schoolwork came home with June. I was glad to see what she’d been doing since she often focuses more on the social aspect of her day when I ask her about it. I do like hearing that, but I also wanted to know what she’s learning. 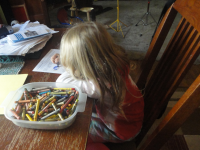 There was a lot of coloring, and tracing and handwriting exercises, connect-the-dots, matching capital letters to lowercase ones and copying words. One sheet was a coloring page of animals they had been given oral instructions on how to color. She’d accidentally colored the duck red and orange instead of yellow and she was distressed to see an X and the word “amarillo” (“yellow”) next to it, even though there was a smiley face on the top of the page. (They all have smiley faces.) She explained to me that they were supposed to color the bird red and she didn’t see the bird at first and thought the duck was the bird and by the time she realized her mistake and tried to color over it she was so flustered she picked up the orange crayon. The blow-by-blow retelling of this error was full of emotion and drama, even though I doubt the teacher made any fuss at all. June does not like to make mistakes. I worry a little about how that will play out for her later in life. The homework assignments she got this week were similar. On Monday she had to color all the items on the page that could be purple. On Tuesday, she had to count items in a row and circle the correct number. Wednesday she had to write out several lines of capital and lower case Is. Thursday she had to circle the largest animal in each row and drawn an X through the smallest one. Another advantage of the immersion program, aside from the big one of learning another language, is that it provides a constant challenge when the kindergarten curriculum is not as rigorous as June could handle. I remember appreciating that with Noah, too. Even though it’s on the easy side, or perhaps because of it, June loves doing her homework. In fact, she was inventing imaginary homework for herself before Señora T started assigning any. Now she races to the dining room table as soon as she gets home from school and gets right down to it. It never takes more than fifteen minutes. On Tuesday, June brought home a golden tiger paw. Now this will require a little explanation. The tiger is the mascot of June’s school and tiger paws (little paper outlines of a paw print) are awarded as recognition of good behavior. Individual students get them and the class as whole can get them, too. June’s very well behaved in public settings, so she’s been racking up the tiger paws. (The mother of one of her classmates confided in me that her son was jealously keeping track of how many she has.) The golden tiger paw marks her tenth tiger paw. When she gets to twenty, she can pick a prize from a collection of small toys. I honestly wish there was not so much emphasis on rewarding behavior that comes easily to her but it is making her happy. She was pleased as punch about the golden tiger paw. Wednesday was Walk to School Day. You are supposed to wear red, walk to a playground near June’s school and then from there, the kids form a little parade, with signs promoting walking and they proceed to school. When I first described the event to June last week she was uninterested. Then I remembered to mention there are snacks and she was all over it. She doesn’t actually have a lot of red clothes, but we found hand-me-down long-sleeve t-shirt that’s mostly white with red and blue sleeves and she paired it with a denim skirt and red socks and decided it was red enough. We walked with a first-grade girl from her bus stop and her mother, down the wooded path by the creek. June wondered if we’d see any of her preschool friends there. And sure enough, soon after we arrived we saw Maggie and her older brother. She and June greeted each other from afar and were headed to each other when at the exact same moment they each caught sight of other friends, from their own classes. There was just a moment’s hesitation and they both pivoted to their new friends. “But you’ve know each other since you were two!” I wanted to say. “Don’t throw each other over for some Janie-come-lately.” But at least it was mutual and there were no hurt feelings. While June’s been at school counting and coloring and soaking up Spanish vocabulary, I’ve been home, trying to learn how to work again. This has been harder than I anticipated. The first week I found it really difficult to concentrate for more than a couple hours at a time and I wondered if my attention span had fallen victim to six years of staying home with kids, during which I rarely had even that much time to focus on any one thing. That got better by the second week, but what I really seem to have lost are my time management skills. I’m working ten to twelve hours a week for Sara, on average, and a little more for other clients and most weeks it seems to be all I can manage. If there are no holidays or half-days (and we’ve had two of the former and one of the latter already), I’m kid-free from 8:30 to 3:10, five days a week. That’s thirty-three hours and twenty minutes. Where is it all going? I am riding the exercise bike more than I used to, and keeping the house marginally cleaner, and reading more, too. But it still doesn’t add up. I think I failed to account for the fact that things I used to do with June around (dishes, laundry, errands) still have to happen so it’s not really thirty-three extra hours a week. And because I don’t drive, simple errands can take a long time. I suddenly feel differently about a trip to the post office or the bank taking up a big chunk of the morning because instead of wanting to kill time, I want to save it. Still, I try to walk rather than take the bus when I can, because I am no longer walking June to and from school and I can use the exercise. I’m hoping I will get more efficient eventually because I have a new client for whom I’m going to edit a series of short articles in October and November and perhaps beyond, so I’m hoping to be able to fit in more working hours. At least I’m not alone. There are two other parents (one mom and one dad) who wait at June’s bus stop and who are also back to work part-time after years of staying home and they seem to be having similar issues. There’s bound to be period of adjustment. Overall, though, it’s good to be working. I like the quiet house, the time to write and think, the challenge of learning new things and new ways to communicate them. June’s and my boats have launched. We couldn’t, we didn’t know how to sail. Now we do.